Join us at the Kansas City Design Center on Tuesday, April 2nd for a public lecture with Jennifer Newsom and Tom Carruthers, the art and architecture duo of Dream the Combine. There will be a public reception at 5:30 pm with the program following at 6:00 pm. Admittance is free and street parking is available. Jennifer Newsom and Tom Carruthers are architects, artists, and co-founders of Dream The Combine, based in Minneapolis, MN. Dream The Combine’s work consists of large-scale, public art installations exploring metaphor, perceptual uncertainties, and the boundary between real and illusory space. They are intrigued by forgotten places and unpredictable audiences, and consistently seek out spaces on the margins in their work. They are winners of the 2018 Young Architects Program at MoMA PS1 for their installation, Hide & Seek. Dream The Combine has exhibited at MoMA and MoMA PS1 in New York, NY; the National Museum of the 21st Century Arts (MAXXI) in Rome, Italy; East Haddam, CT; Vancouver, BC; Minneapolis and St. Paul, MN. Their work has been published widely, including the New York Times, Metropolis Magazine, Architect Magazine, Architectural Record, Dezeen, The Architects Newspaper, and the Huffington Post. In addition to Dream the Combine, Jennifer is an Assistant Professor at the University of Minnesota School of Architecture and Tom is co-owner of Jacobsson Carruthers, a metal fabrication studio in Minneapolis. They are both graduates of the Yale School of Architecture. Join us at the Kansas City Public Library on Thursday, March 21st for a public lecture with Matthjis Bouw as he discusses the need for increased attention to urban resilience in design. A reception will be held starting at 6:00 pm with the lecture following at 6:30pm. Admittance is free and parking is available in the Plaza Branch’s free parking garage. Matthijs Bouw is a Dutch architect and urbanist and founder of One Architecture (est. 1995), an award-winning Amsterdam and New York-based design and planning firm. He directs the Urban Resilience Certificate Program for PennDesign at the University of Pennsylvania. Bouw’s work at UPenn theorizes and positions design as an integrator and innovator among scales, disciplines, actors and issues in urban resilience and water management projects.Additionally, he researches how to achieve and increase ‘resilience value’ in the implementation of complex projects. He is a member of the ULI panel that writes the ’10 principles for building resilience’. Bouw’s practice is known for its unique approach in which programmatic, financial, technical and organizational issues are addressed, communicated and resolved through design. Bouw has been a pioneer in the use of design as a tool for collaboration, for instance through the development of ‘Design Studios’ as an instrument to support the Netherlands’ Ministry of Infrastructure and the Environment with its long term planning, with such notable projects as the Deltametropolis Studio and Randstad 2040. The office works on flagship resilience projects in New York, Boston and San Francisco. A co-leader of the BIG Team that won the Rebuild by Design competition for the flood protection of Manhattan, ONE is currently part of the multi-disciplinary teams executing the first phase of the East Side Coastal Resiliency project for Lower Manhattan, as well as planning the Lower Manhattan Coastal Protection project. In Panama City, Bouw is the urban designer in the ‘Water Dialogues’ team. In the Philippines, he is the urban planner for the Asian Development Bank on New Clark City, and works on nature-based disaster reduction in Tacloban. In the Netherlands, ONE is part of the ‘Hackable City’ team for Buiksloterham, a large scale brownfield redevelopment in Amsterdam-Noord based on the principles of the circular economy. Join us at the Nelson Atkins Museum of Art on Tuesday, March 5th for a public lecture with Fuensanta Nieto. Fuensanta Nieto is a founding partner of Nieto Sobejano Arquitectos and a professor at the Universidad Europea de Madrid. Fuensanta Nieto lectures on architecture and participates in juries and symposia at various institutions around the world. From 1986 to 1991 she was co-director of the architectural journal ARQUITECTURA, published by the Colegio Oficial de Arquitectos de Madrid. Her firm was founded in 1985 with Enrique Sobejano, and together their work has been awarded numerous prizes including the 2007 National Prize for Conservation and Restoration of Cultural Heritage, the 2010 Nike Prize from the Deutscher Architekten, as well as the 2010 Aga Khan Award for Architecture. Nieto Sobejano Arquitectos currently has projects in Germany, Spain, Austria, Estonia, Morocco, China, United Kingdom and France. This talk is presented in partnership with the Nelson Atkins Museum of Art and Kansas State University where Fuensanta Nieto serves as the Victor L. Regnier Distinguished Visiting Chair in architecture. The Regnier professorship was established in 2003 to bring the finest architects from around the world to benefit the students of Kansas State and the public in the Kansas City region. This is a free event but tickets are required, you can reserve them here. This program is presented when the museum is closed, please enter through the Bloch Lobby. Doors open at 5:30pm. Join us Wednesday, December 12th as we share our Prospect Avenue Nodal Study Project! Join us for a public lecture with Brent Ryan. A social hour will be held starting at 5:30pm, with the lecture following at 6:00 pm; admittance is free and street parking is available. Brent D. Ryan is Head of the City Design and Development Group and Associate Professor of Urban Design and Public Policy in MIT’s Department of Urban Studies and Planning. His research focuses on the aesthetics and policies of contemporary urban design, particularly with respect to current and pressing issues like deindustrialization and climate change. Professor Ryan’s first book Design After Decline: How America rebuilds shrinking cities, was selected by Planetizen as one of its ten best urban planning books of 2012, and his second book, a treatise on urban design as a plural art, will be published by MIT Press in 2017. We are at the end of our two-year public space study in the West Bottoms! In lieu of the usual KCDC end-of-year Open House, we’ve put together a week-long exhibition in the West Bottoms, featuring work by the KCDC urban design studio and West Bottoms Reborn design team artists. The exhibition will soft open on Saturday, May 5th at 5 pm and run through May 12th, with a formal reception happening on Thursday, May 10th, from 5 pm - 8 pm (light refreshments will be served). 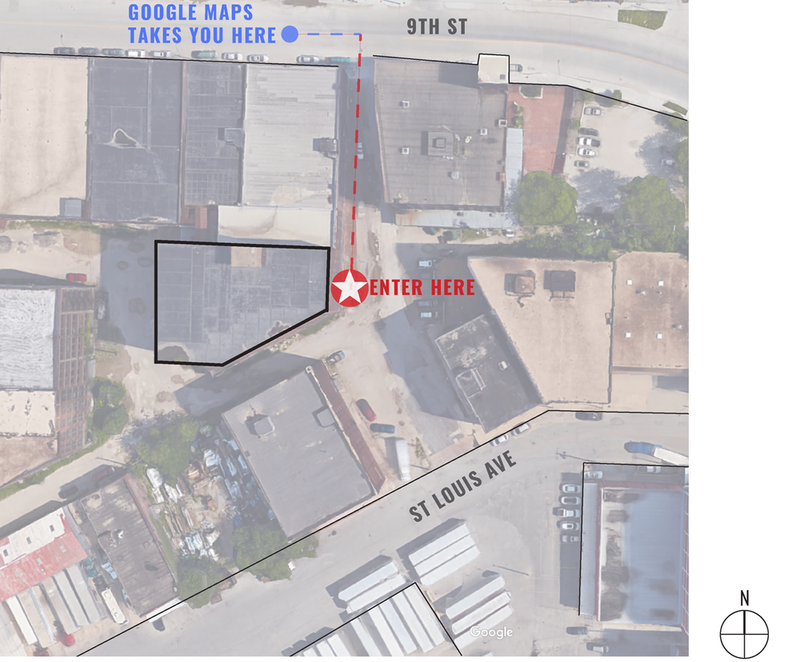 The entrance to the exhibition space is in the alley between W 9th St and St. Louis Ave, behind the Hobbs Building. Entering 1501 W. 9th St. into Google Maps will take you to the entrance of the alley, please follow this map to find the exhibition space entrance. Megan Crigger, City of Kansas City, Missouri Director of Creative Services, moderates a panel discussion with artists Miranda Clark, Carmen Moreno, and James Woodfill to discuss their experiences as embedded artists on a design team and issues related to artist agency, conflict, problem-solving, blind spots, and authenticity. Q&A immediately follows the presentation. Space is limited and registration is required. Tickets are available via Eventbrite ($5 which includes lunch). Free parking is available. Miranda Clark is a sculptor currently residing in Kansas City, Missouri. She received her B.F.A from the Kansas City Art Institute in 2014 and went on to complete a two-year residency with the Charlotte Street Foundation Studio Program. Miranda's work explores the physicality of personal memories through sculpture, drawing, and photography. Carmen Moreno received her BFA in 2010 from the Kansas City Art Institute in Interdisciplinary Art and Creative Writing with a Certification in Community Arts and Service Learning. She currently works as an independent artist in Kansas City and has exhibited works and ideas in numerous places all over the world. Carmen's pieces are mainly generated by her interest in science, art, philosophy, color theory,...basically everything. She maintains a studio practice of experimentation and open-mindedness. In applying the sensibilities of science to art, Carmen attempts to create a visual language that transforms her emotional-intuitive experiences into innovative installations and performances. James Woodfill is a 1980 graduate of the Kansas City Art Institute and has lived and worked in Kansas City since. As an interdisciplinary artist, his work is focused on direct experience through the composition of objects, occurrences and site. His artworks regularly blur boundaries in their execution, often merging with functional design. His installations bridge the fields of sculpture, painting and public art, and his work in the public realm has extended into education and curatorial projects, writings and numerous urban planning projects and studies. Appointed in January 2015, Megan Crigger (Kansas City, MO) serves as the Director of Creative Services for the City of Kansas City, MO, Office of Culture and Creative Services, which facilitates conversations for policy, partnerships and programs to directly support arts, culture, and creative sectors, the creative economy and neighborhood vitality. Prior to this position, Ms. Crigger was the Cultural Arts Division Manager (2010-2014), Art in Public Places Director (2003-2010) and Art in Public Places Project Manager (2000-2003) for the City of Austin, Texas, Economic Development Department. Her professional board leadership has included the United States Urban Arts Federation (current), Consensus Board of Directors (current), Texans for the Arts Executive Board of Directors, and Executive Committee for the Any Given Child initiative from the John F. Kennedy Center for the Performing Arts. Ms. Crigger holds a Bachelor of Art in Psychology, Bachelor of Fine Arts in Art History, and a Master of Arts in Arts Education from the University of Texas at Austin. 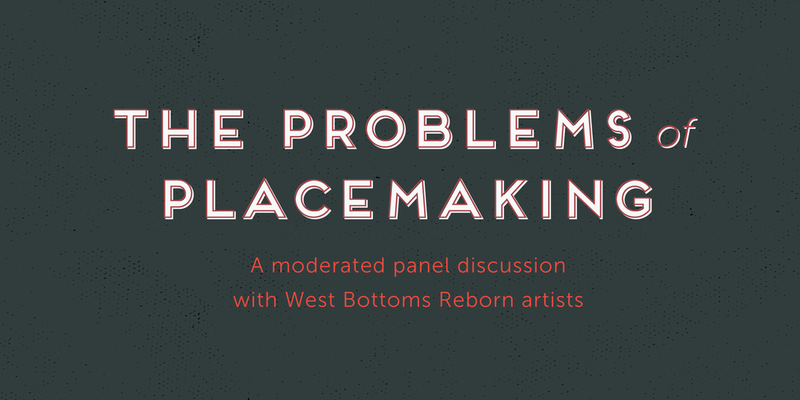 This presentation is part of Honoring History + Place, a public engagement series designed to engage the general public, arts and business communities, and civic agencies about creative placemaking in Kansas City. Honoring History + Place is an initiative of the West Bottoms Reborn project that's supported by the National Endowment for the Arts Our Town grant, with special event funding support by the Neighborhood Tourist Development Fund (NTDF) program. Project partners include the Kansas City Design Center; Kansas City, Missouri Office of Culture & Creative Services; Historic West Bottoms Association; Kansas City, Missouri Planning Department; KC Water; Unified Government of Wyandotte County, Kansas; Artists Miranda Clark, Carmen Moreno, and James Woodfill. For more information, contact info@kcdesigncenter.org. Award-winning Spanish architect and current Victor L. Regnier Distinguished Visiting Professor at Kansas State University, Fran Silvestre, will talk about his studio’s creative process. According to architecture critic and journalist David Cohn, “Silvestre’s designs are not simply solutions to given design problems, though he tends to present them as such. They absorb and distill the myriad issues of program, site and context, structure, building technologies and so on, subsuming them into the play of space and form that could be understood as the true subject of his architecture.” Fran Silvestre will reveal the most important values of his architecture and the methods his studio uses to achieve such innovative projects. This presentation documents grassroots efforts to reuse and enjoy iconic but economically obsolete industrial places in the American Rustbelt and in other U.S. Cities. Exploring a range of deindustrialized sites including former automobile factories in Detroit, a steel plant in metropolitan Pittsburgh, the Silo City campus of grain elevators in Buffalo, and former port sites in New York City, it assesses emerging forms of preservation, placemaking, and urban development practices, which operate outside traditional adaptive re-use markets and without substantial public funding. Building upon small scale, itinerant, and often guerrilla actions, these (mostly) do-it-yourself practices exploit historic sites in their “as is” condition, making the most of marginality and local cultural capital. Pursued out of a sense of passion and the desire to be a part of the physical reconstruction of their respective cities, the diverse and sometimes unusual parties that undertake these projects are redefining historic preservation as an empowering civic activity. Accordingly, their incremental, sweat-equity driven projects provide an experience of industrial heritage that is more playful, immediate, and broadly participatory than those at better capitalized sites, even as they fall short of professional preservation standards (and thus eligibility for significant federal and state tax credit support). Daniel Campo is a NYC/Baltimore-based urbanist. He is Associate Professor and Program Director of City Planning in the School of Architecture and Planning at Morgan State University. Campo is the author of The Accidental Playground: Brooklyn Waterfront Narratives of the Undesigned and Unplanned (Fordham University Press, 2013) and has published articles on a range of subjects including urban design, public space studies, placemaking, public art, downtown revitalization, history of the built environment and historic preservation. He holds a Ph.D. in city planning from the University of Pennsylvania and was previously a planner for the New York City Department of City Planning. The KCDC will be hosting a public meeting on Thursday, February 15th from 5:30pm-7:00pm at the KCDC (1018 Baltimore Ave, KCMO 64105). If you are able to attend, we would greatly appreciate your feedback and input on three sites in the West Bottoms currently undergoing public space design development. Kansas City Art Institute Professor and artist Karen McCoy converses with City of Oakland Cultural Affairs Manager and creative placemaking thought leader Roberto Bedoya about how imagination and policy influence each other. Q&A immediately follows the presentation. Space is limited and registration is required; please register on Eventbrite. Tickets are $5 which includes lunch. Free parking is available. Roberto Bedoya has consistently supported art-based civic engagement projects and advocated for expanded definitions of inclusion and belonging throughout his career. As executive director of the Tucson Pima Arts Council (TPAC), he established the innovative P.L.A.C.E (People, Land, Arts, Culture and Engagement) Initiative to support artist initiatives in Tucson, Arizona. Bedoya’s tenure as executive director of the National Association of Artists’ Organizations (NAAO) from 1996 to 2001 included serving as co-plaintiff in the lawsuit Finley vs. NEA. His essays “U.S. Cultural Policy: Its Politics of Participation, Its Creative Potential” and “Creative Placemaking and the Politics of Belonging and Dis-Belonging” reframed the discussion on cultural policy to shed light on exclusionary practices in cultural policy decision making. Bedoya is also a poet, whose work has appeared in numerous publications, and an art consultant, with projects for Creative Capital Foundation, the Ford Foundation, The Rockefeller Foundation, and the Urban Institute. Roberto Bedoya currently works for the City of Oakland, where he was hired as the City’s first Cultural Affairs Manager in 2016. Karen McCoy’s primary work has been large-scale, sited environmental sculpture based on extensive research into the geological, cultural and social histories of each site. She also works in video and photography and makes drawings and prints. She was awarded the Pritzker Foundation Endowed Fellowship for a distinguished residency. In 2003, she was selected as lead artist for the Lewis and Clark Bicentennial ArtCorps project, funded by the National Endowment for the Arts. Her work has been exhibited around the country. McCoy has taught at KCAI since 1994, serving as chair of the department from 1994 to 2003 and as acting chair in 2010-11. She earned an M.F.A. degree at the School of the Art Institute of Chicago in 1978. For more information, please visit www.kcdesigncenter.org or contact info@kcdesigncenter.org. Please join us on Thursday, December 14th from 5pm-8pm at the KCDC for our end-of-semester Open House. 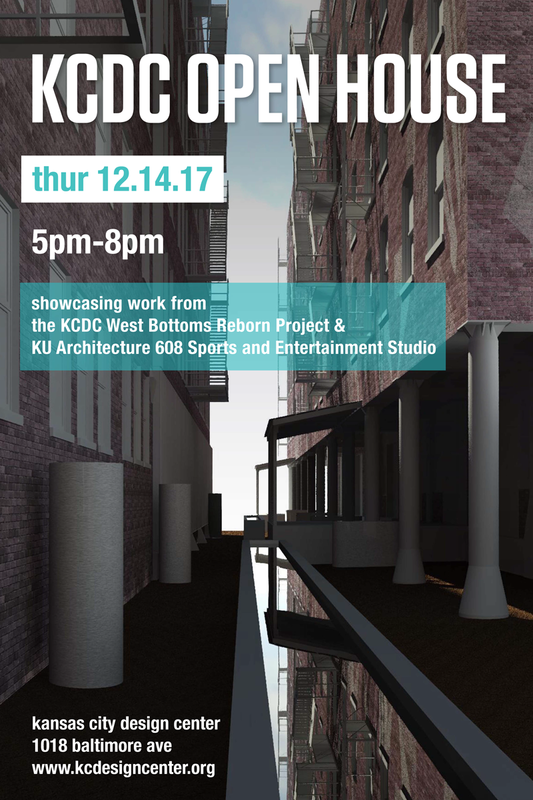 KCDC students will be presenting work from the second phase of the West Bottoms Reborn project, and the KU Architecture 608 Sports and Entertainment Studio will also be presenting work from the semester. Light refreshments will be served and street parking is available. We hope to see you there! Neighborhood Prospects is an urban design student and student / community service learning project that seeks to build momentum in revitalization efforts in historic neighborhoods along Prospect Avenue. Conducted by the Kansas City Design Center in collaboration with the Santa Fe Area Council and Key Coalition Neighborhood Association, the study focuses on creation of scenarios for a variety of inﬁll development types that support community vitality and social, environmental and economic sustainability. Please join us for our second public meeting, where KCDC students led by Professor Joe Colistra will present work in progress and solicit community feedback. The presentation will include discussion of investment corridors, lot prioritization strategies, pedestrian linkages, inﬁll scenarios, and development incentives. Community participation and feedback will support ongoing development of Neighborhood Prospects, with the hope that ideas generated in the project can contribute to a shared dialogue addressing ways to harness emerging public and private development activity along the Prospect Ave. corridor to support revitalization in surrounding neighborhoods. 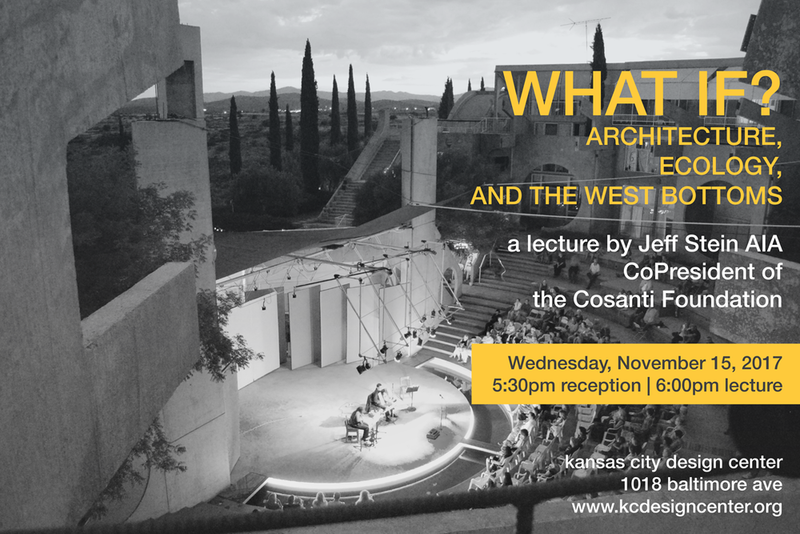 Join us for a public lecture with Arcosanti architect and urban designer Jeff Stein. A social hour will be held starting at 5:30pm, with the lecture following at 6pm; admittance is free and street parking is available. In this illustrated lecture, Jeff Stein AIA, CoPresident of the late Paolo Soleri's urban research institute, the Cosanti Foundation explains Soleri's lifetime of work investigating the role of complexity, compactness, and beauty in the organic life of cities and describes how the continuing work at Arcosanti in Arizona could help guide development as Kansas City's West Bottoms precinct becomes Reborn. Calling all West Bottoms stakeholders and community members! 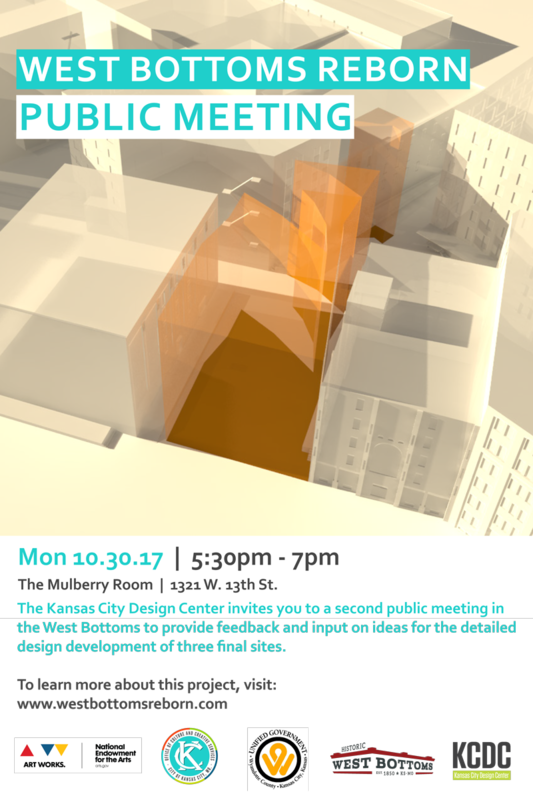 The KCDC will be hosting a public meeting on Monday, October 30th from 5:30pm-7:00pm at The Mulberry Room in the West Bottoms, 1321 W. 13th St. If you are able to attend, we would greatly appreciate your feedback and input on ideas for the detailed design development of the three final sites. Your feedback is critical, and we are grateful for your continued support. Join us for a public lecture with Ryan Gravel, the visionary architect and urban planner behind the Atlanta Beltline. A social hour will be held starting at 5:30pm, with the lecture following at 6pm; admittance is free and street parking is available. The Atlanta Beltline was born in academia as a simple idea for a better way of life. Now, it’s a $4 billion infrastructure project in the early stages of implementation. Its original author, Ryan Gravel, will describe how this catalyst project came to life, what it means, and why it matters. Building on the title of his new book, Where We Want to Live, Gravel will expand on these ideas, sharing how similarly-transformative projects – from the Rail Park in Singapore to the concrete Los Angeles River – represent a new kind of cultural momentum that will reshape the way we build cities. He’ll conclude with current work on the Atlanta City Design, a daunting endeavor to go deeper than the Atlanta Beltline and discover the city’s civic identity. By organizing around its core values, the city will ensure that its anticipated growth will deliver the best version of Atlanta, not some other place that people don’t like or recognize anymore. Ryan Gravel is an urban planner, designer, and author working on infrastructure, concept development, and policy as the founder of Sixpitch. His master’s thesis launched the Atlanta Beltline, which through fifteen years of progress, is now changing both the physical form of his city and the decisions people make about living there. Alongside other projects at Sixpitch and research on similar “catalyst infrastructure” projects around the world, Ryan’s book, “Where We Want to Live,” (St. Martin’s Press, 2016), investigates this cultural side of infrastructure, describing how its intimate relationship with our way of life can illuminate a brighter path forward for cities. Join renowned artist Julie Schenkelberg as she discusses her installation process and unique method of building. Her site-specific installation, on view at PLUG Projects from Sept. 15 thru Oct. 28, responds to the West Bottoms' rich history. Registration is required to attend. To register, click here. 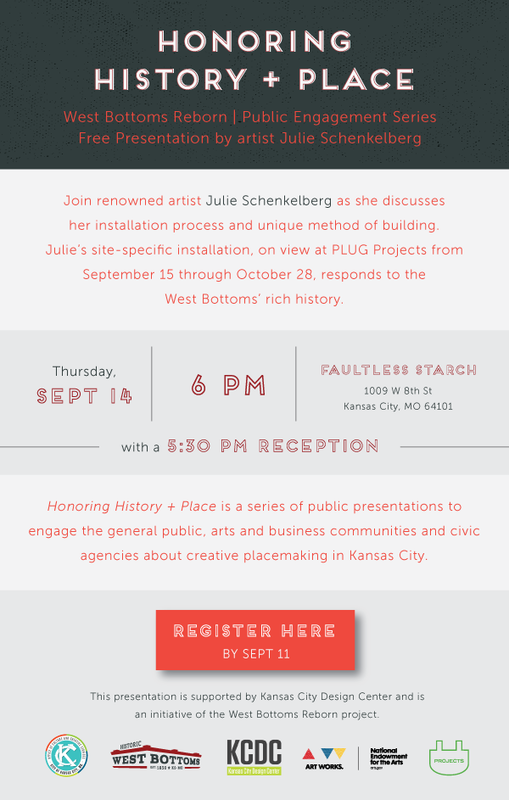 Honoring History + Place is a series of public presentations to engage the general public, arts and business communities and civic agencies about creative placemaking in Kansas City. 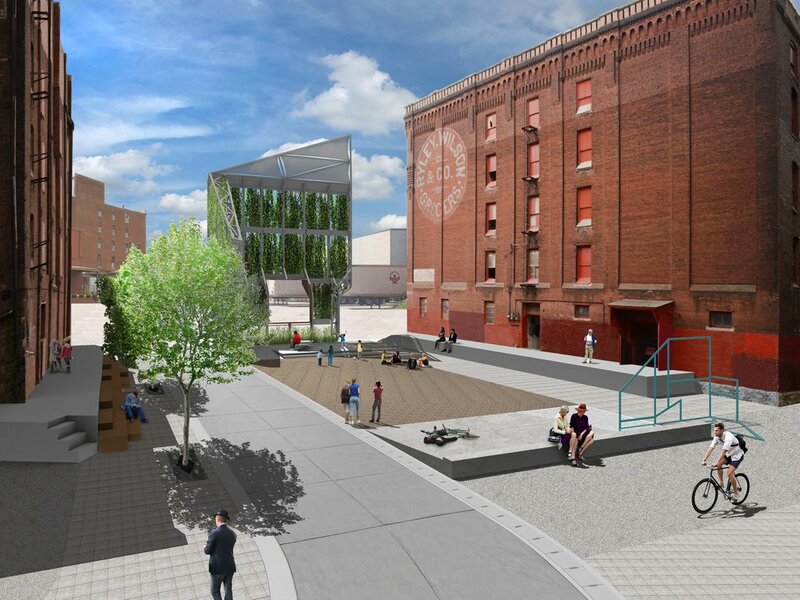 This presentation is supported by Kansas City Design Center and is an initiative of the West Bottoms Reborn project that's supported by the National Endowment for the Arts Our Town grant. We are entering the second phase of the West Bottoms Reborn project, with a new group of students and continuing Design Team members. 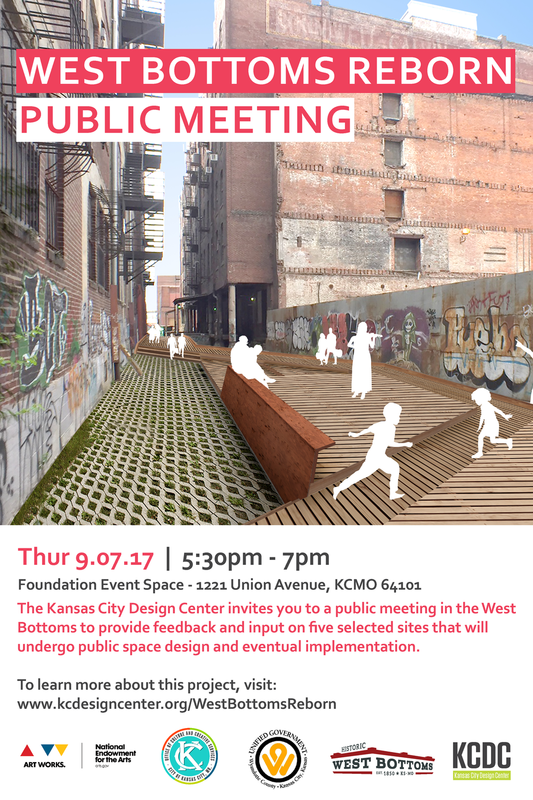 The KCDC will be hosting a public meeting on Thursday, September 7th from 5:30pm-7:00pm at Foundation Event Space in the West Bottoms, 1221 Union Avenue. If you are able to attend, we would greatly appreciate your feedback and input on the five sites the KCDC Design Team has selected for public space design and eventual implementation. Your feedback is critical as the project moves forward into the design phase, and we are grateful for you continued support. The KCDC is pleased to host 18 Details, an exhibition of 18 projects in the region from firms located in the Greater Kansas City area, curated by Kansas State University Assistant Professor Genevieve Baudoin. The purpose of the exhibition is to define what building culture in this area is or is becoming through the detail – the moment where drawing, building, place, client, and design meet. The exhibition aspires to reveal the quality fostered by the unique nexus of the design community drawn here, the clients, patrons, and other personalities that contribute to that community, the builders, and the engineers that enable the work here, as well as our climate, our history, and our future in this place. BNIM; DLR Group; DRAW Architecture + Urban Design; el dorado architects; Gould Evans Associates; Helix Architecture + Design; Hoefer Wysocki; Hollis + Miller Architects; Hufft; KEM Studio; PGAV Architects; Populous, Inc.; Rockhill & Associates; Seligson/Eggen; SFS Architecture; & Studio 804. Curated by Asst. Prof. Genevieve Baudoin, Architecture Dept., Kansas State University. Made possible with funding from the Professional Advisory Board to the Architecture Department, College of Architecture, Planning & Design, Kansas State University. For more information, see Press Release. Please join us next Tuesday from 5pm-8pm at the KCDC for our end-of-semester Open House, where students will be presenting results from the first phase of the 2-year long vision study for a system of public spaces in the West Bottoms. This is also a public meeting event; the public and stakeholder community are invited to provide their input to insure their ideas are integrated into the development of the next phase of the project. The feedback we receive from our public meetings is vital to a unified vision for the enhancement of the quality of the West Bottoms, and we would greatly appreciate your attendance as well as sharing this event with others. Maria Masià is a practicing architect, with honors by the ETSA of Valencia and in the specialty of architectural projects (Honors) by the Universidad Lusiada de Oporto. She joined Fran Silvestre Arquitectos in February 2011, where she has occupied various roles such as Studio Leader and currently holds the title of Managing Director of the firm. She is Professor of projects and general coordinator of the Master’s Architecture, Design, and Innovation at the European University of Valencia. Join us on April 13th at the KC Central Library for a lecture by Kansas State University 2016/17 Victor L. Regnier Distinguished Visiting Chair Gonçalo Byrne. A reception will be held at 6pm, with the program beginning promptly at 6:30pm. The Central Library parking garage is located directly west of the Central Library building on the northwest corner of 10th & Baltimore and there will also be limited street parking available. Buildings have a life of their own, between permanence, transformation, vulnerability and the inhabitant’s appropriation. Through a series of recent works, we intend to debate some issues related to the contemporary practice of architecture, namely the different means architecture holds to build different spatial sensations that go beyond the first impact that its image may cause, but improve people’s lives and endure in time. These ideas were carefully developed in the selected works located in contexts where a careful balance between time, heritage and invention was urgent. From intimacy to the public space, architecture tries to find its own temporality. Gonçalo Byrne is an architect graduated from the School of Fine Arts of Lisbon (ESBAL), and an Honorary Degree from the Faculty of Architecture of the Technical University of Lisbon and from the Faculty of Architecture of Alghero, in Italy. In 1975, he established his own practice, and founded his firm Gonçalo Byne Arquitectos in 1991. Along the years, he has been teaching at several universities including those in Coimbra, Viseu, Lausanne, Venice, Mendrisio, Leuven, Harvard, Pamplona, Lisbon, and currently in Milan and Kansas City (US). Among his recent works are the requalification of the headquarters of the Portuguese National Bank, in Lisbon (with João Pedro Falcão de Campos); the requalification of the Thalia Theater, in Lisbon (with Barbas Lopes architects); the expansion of the National Museum Machado de Castro, in Coimbra; the Estoi Pousada de Portugal, in Faro; the Estoril Sol Complex, in Cascais. Byrne’s work has also been awarded, among many others, with the prize A.I.C.A. / S.E.C., the Gold Medal by the French Academy of Architecture, and the Piranesi Prix de Rome 2014 for the National Museum Machado de Castro, in Coimbra. We need your feedback!! Please join us for a community charrette to help select three public spaces in the West Bottoms for design development. To learn more about this project, please visit our project page. Parking at The Muberry Room: Parking is available in the back of the building as well along 13th St and Mulberry St.
*For those unable to attend the public meeting, please fill out our site selection survey online. Please join us for an Open House at KCDC where students will be presenting results from the Scarritt Renaissance Vision Study. All are welcome and students will be on hand to answer questions and discuss their work. Light refreshments will be served and street parking is available. Join us Wednesday, November 16th at the KCDC for a lecture by Martin Felsen of UrbanLab. A social hour will be held starting at 5:30pm, with the lecture following at 6pm; admittance is free and street parking is available. Martin will present UrbanLab's new book titled "Bowling," which explores relationships between architecture and infrastructure. Bowling is a design approach that makes physical "bowls" in the urban landscape to align shared resources with city life. Some bowls are made from scratch, while others are assembled from repurposed geological formations and urban infrastructures. UrbanLab's bowls span scales, from small buildings and spaces, to industrial districts and wide-ranging regions. Plying the boundaries between practice and education, Martin Felsen blends design and data to produce uniquely progressive, site-specific built works and research, resulting in a new aesthetic for environmentally resilient architecture, landscapes, and public space. Martin founded UrbanLab as an alternative practice aiming to synthesize diverse methodologies, technical innovation, and hybrid vocabularies drawn equally from architecture and its complex urban and natural contexts. Join us Tuesday, October 11th at the KCDC for a lecture by Tom Campanella. A social hour will be held starting at 5:30pm, with the lecture following at 6pm; admittance is free and street parking is available. We tend to associate the emergence of the American expressway with the Eisenhower era and the Interstate highway program. But the origins of the modern motor road date back much further, to a series of parkways built in Westchester County, New York in the 1920s. The first of these, the Bronx River Parkway, was begun not as a road but as an effort to restore a terribly polluted waterway, led by one of the most problematic figures in American environmental history, Madison Grant. This talk will explore the roots of the modern American highway, examine the individuals who brought it into being and unpack the design ideals that helped shape an infrastructure that would change the world. Campanella is an historian of city planning and the urban built environment. He teaches at Cornell University and writes about the culture-space nexus in a variety of contexts, seeking to explain the manifold agents, actors, and forces that have shaped urban landscapes around the world. Though primarily an Americanist, he has also studied and written about the extraordinary growth of Chinese cities in the post-Mao era. Campanella has received Guggenheim and Fulbright fellowships, and is a Fellow of the American Academy in Rome and the James Marston Fitch Foundation. His books include The Concrete Dragon: China's Urban Revolution and What It Means for the World (2008), and Republic of Shade: New England and the American Elm (2003), winner of the Spiro Kostof Award from the Society of Architectural Historians. He has held visiting appointments at Columbia, Harvard GSD, Nanjing University, and the Chinese University of Hong Kong. Campanella holds a Ph.D. from the Massachusetts Institute of Technology (1999), a M.L.A. from Cornell (1991), and a B.S. from SUNY College of Environmental Science and Forestry (1986). Please join us for an Open House at KCDC where students will be presenting results from the Downtown Recycling System Vision Study, the Art in the Loop Vision Study, and the Connecting the Dottes Study in Kansas City, Kansas . All are welcome and students will be on hand to answer questions and discuss their work. Light refreshments will be served and street parking is available. Did you miss our Open House in May?? No worries! An exhibition of KCDC work from the 2015-16 academic year will be on display through the summer. The complexity of architecture shifts according to cultural, regional and performance demands. “Performative Poetics” will share Jay Siebenmorgen’s analytical process of design by comparing 6 projects of varying scale, program and locations around the world, where constraints and regional influence are used as opportunity to define architecture in a different light. Join us at the KCDC on Thursday, March 24th, for a public meeting where the KCDC studio will be presenting the progress of their work this semester on the Art in the Loop Vision Study and the Downtown Recycling System Vision Study and asking stakeholders to provide their input. The feedback the studio receives is critical to the success of KCDC projects, so please attend and bring a friend!